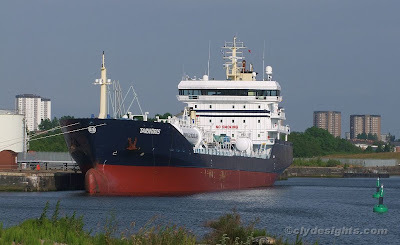 Also seen on Sunday was the tanker TARNBRIS as she neared completion of discharge in Rothesay Dock. Built in 2007 at the Selah yard in Turkey, TARNBRIS has a deadweight of 10,300 tonnes and is 129.5 metres overall. Owned by Tarntank Rederi AB, she had originally been ordered by Turkish Atlantic Denizcilik but was resold to Tarntank just six months prior to her completion.